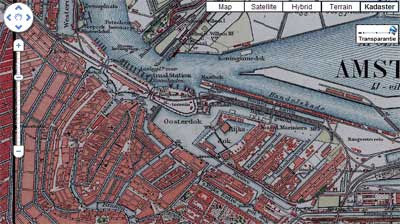 Historiekaart allows you to view historical maps from the Dutch Land Registry overlaid on Google Maps. The collection includes maps from 1829 to 1949. It is possible to search the map by location to view an historical map of any town in the Netherlands. It is also possible to search the map by date to view the historical map from the collection that most closely matches your chosen year. The map includes a handy transparency slider so that you can compare the historical map with the modern Google Maps base layer. Google Map mashup of historical map layers and historical photographs in the province of Utrecht. 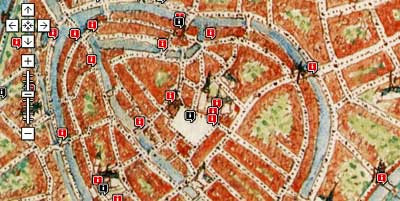 The Amersfoort 750 map makes use of the collection of the town's Museum Flehite to illustrate the history of Amersfoort. The map shows the location of buildings in the town of historical interest. It is also possible to view a number of historical maps using the Google Maps interface to observe how the town has developed over the centuries. Thank you for listing Utrecht van Boven again. Also relevant to this post might have been Amersfoort op de Kaart which has 6 historical map layers ranging from 1565 to 1979. But of course you already did a nice review of that site.